If a video game contains guns, does it also contain bullets? Not necessarily. Well, not necessarily — get this — depending on your philosophical take on what it means for a bullet to exist. The case of the missing bullets in video games is more of a quirk than a dire tragedy. There is no scandal behind the fact that if you stare at your favorite shooter game, watch a video of it in slow-motion or scruitinize its screenshots you may not see a bullet. Some games just don't show the bullets. You pull the trigger of your oh-so-visible virtual gun. You see the muzzle flash. You see the spent casings eject from side of your rifle. You see the impact of your shot. But in many games — not all — no visible bullet left your weapon and traveled to the place where the damage was dealt. There's a good programming reason for leaving bullets out of the picture. And there's a wonderful philosophical justification for doing so . For the programming reason, you have to accept the classic video game need for machine guns and for lots of shooting. If video games were stage plays in which there was one gun, maybe five shots fired, and that was that, then they probably could all show their bullets. Video games, however, are not stage plays. Games with guns have thousands of shots fired. When a player fires a gun in a game, what usually happens is that an invisible line is immediately drawn — tested — in the video game world, connecting the player's aimed gun with whatever the fired shot is going to hit. If the target is a wall, the wall will be changed to depict the result. Maybe it becomes chipped. Maybe it crumbles. If the target is a red barrel, maybe a sequence is triggered that shows the barrel blowing up. If the target is a body of an enemy, specific animations will ensue. Maybe the enemy falls. Parameters will change. Maybe the enemy now have less life energy and is closer to being killed. None of that is all that different from what would happen in the real world. A shot is fired. There is a result. The big difference in how things work — aside from that pain, injury and possible mortal consequences thing — is that everything that happens in the video game world comes at a cost to the computer hardware. That computer hardware has to have the power and speed to determine what the results of a shot should be and then illustrate it. The engines of our computers and game consoles must render these results as a part of the scene we see, a scene that is shown, frame after frame, 30-60 frames in a second. If the computer has too much work to do, it will show fewer frames. The virtual world will become stacatto. 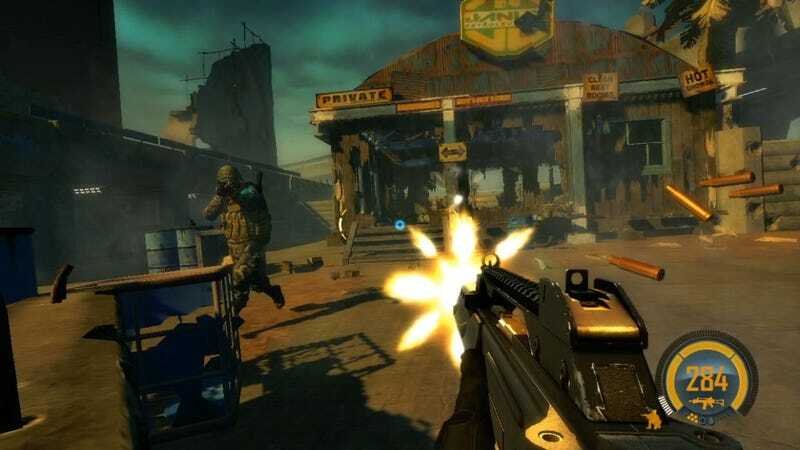 There are other optional differences between those shots fired in the real world and in a first-person shooter: in games, those shots may not involve the traveling of an object through the air and the shots may be — faster than a speeding bullet — infinitely fast. Jon Creighton, programmer on upcoming firsrt-person shooter Bodycount and veteran of the PlayStation 2 and Xbox gun-crazy shooter called Black, explained what programmers and game designers already know: how shooting in a game works and why bullets can ruin the action of any video game that has been built to run at a steady framerate. He did this for Kotaku over e-mail. He was invited to be as specific and technical as he desired. "Because real bullets travel so fast," he wrote, "They move a fair distance each frame. To simulate that in games you have to use a single line which projects out into the scene, and for shotguns you create a spread of multiple lines. "No matter what physics engine is used, testing a line against the game world is an expensive operation, since you have to search through a large model of the scene, which we call a collision mesh. With the current generation of consoles you can do a number of these tests at the same time. But, on the PlayStation 2, you were limited to doing one after another. That meant that you could only handle 10 or 20 of these line tests per frame. "Because of this cost, most games treat the bullets as infinitely fast and run the line test through to the limit of the range of the bullet. If the bullets aren't represented like this, then you have to perform multiple line tests, one after the other, on each subsequent frame until the bullet hits something. This means that you'll have a huge number of line tests to manage every frame and that's a killer for performance." If it makes so much sense to have infinitely fast invisible bullets, why even consider having slower bullet-speed bullets that look like bullets? The list of reasons is short. If a game developer shows the bullets and makes them objects in the world, they can have them physically interact with the objects in it. They cann depict them dropping as the in-game gravity tugs at them. They can have them ricochet off an object or enemy using the same type of physics system that determines how a video game car carroms off a video game guard rail or how a video game body falls off a video game skateboard. But, as teams like Creighton's Bodycount crew realized, you may not see value in such rewards. "We investigated having more complex ballistics in Bodycount, but the associated cost really wasn't worth it," Creighton said. "So we're doing an approximation that adds in a delay between the firing of the bullet and when it hits. Bodycount is very much an arcade shooter. We're not looking to make a perfect simulation of the characteristics of each weapon; we're after the effect." It's more likely, Creighton and other game creators interviewed for this story said, for games that emphasize sniping or other more clinical aspects of focused gun conflict to render their bullets in their virtual air. Games that show gunplay in slow-motion, such as the pioneer creations of "bullet time," the Max Payne games, also render their bullets as objects in their virtual world. While nothing in a video game world is tangible, some things are more virtual than others. Stand your character, his or her back toward you, in a room in a three-dimensional game and you can assume that what is in front of the character is being drawn by the hardware on which the game is running. Of course it is. You can see it. But whatever is down the hallway, around the corner and through a locked door tends not to be drawn, certainly not in full detail, not when it is so far out of sight. Is that other part of the game world, the part that you can't see just yet, there or not there? The game designer might tell you that it is as there as it needs to be. You could have an existential argument about trees being rendered in a forest where you can't yet see or hear them. Or you could just agree that only the results matter. What needs to be seen will be seen — when it needs to be seen. You can say the same about virtual bullets. But note the implicit irony: you don't need to see the bullets. After all, in real life, when a bullet is in the air, who can? Doom co-creator and game historian John Romero recently told Kotaku that he believes that programming a bullet so that it's a visible object flying through a game world is, usually, a waste of time. It doesn't give the game designers much of a prize. "The reward is the feedback for what the bullet does," he said. "The feedback is in the flash, the ejection and the particle effect on the wall that it hits. Just like in real life, the feedback you get is the same you get in the game, which is muzzle flash, sound and something at the end." The game creator can just calculate the pull of gravity and have the bullet make its impact lower than the height from which it was fired. They can time-delay it, as the Bodycount developers are doing, so that it seems to have traveled, for a split second, through the air. Who needs to see the thing fly? Who could? And here's the core question: If you can't see the bullet, but if a bullet's path has been determined, its speed has been calculated and its impact has been rendered, was the bullet really not there? Was the bullet in any way different in its existence vis a vis the virtual people near it than a bullet in the real world? If games are about faking reality, some might argue, that's one fake that is good enough. There could be a day when the machines the run games are powerful enough that bullets could be in all of our shooter games. Each bullet could whiz past our character's head or arc across a battlefield. Even then, though, Creighton points out that gamers might not even notice it. "If they can't see far enough and with a great enough level of detail to notice the delay between the muzzle flash and the bullet impact, then it might not be worthwhile." Guns have been an integral part of video games since the time when video games were invented. Bullets? Still optional, still debatable, still not quite there, depending on your point of view.